If you watched the video (thank you) you’ll see that I designed a template to allow you to make paper craft style cubic boxes. I designed it so that you can relatively easily make a box adorned with whatever images you desire and and any specific size you desire, all based off of a single simple template. You’ll need two completed templates to create one box. The box sides are sized to 100 mm at a resolution of 300 ppi, tilted at 45 degrees. I recommend creating each side as a 100 mm square at 300 ppi. Then you can paste it into the appropriate template and alter the angle in the correct 45 degree increment to fit the intended panel. When I edit the templates, I place my face images under the template lines layer. 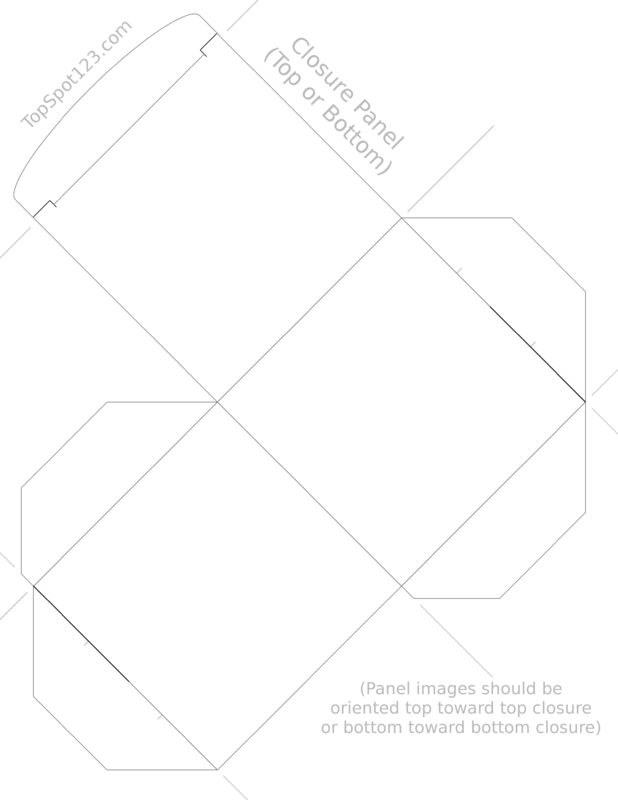 Each template can represent the only three sides of a cube that can be seen at once. This allows for simple creation if your design doesn’t require a specific lid closure placement (See Question Block for example). If your design benefits from a specific lid closure placement (See Sonic Monitor for example), it is helpful to understand how both templates work together to form a box. 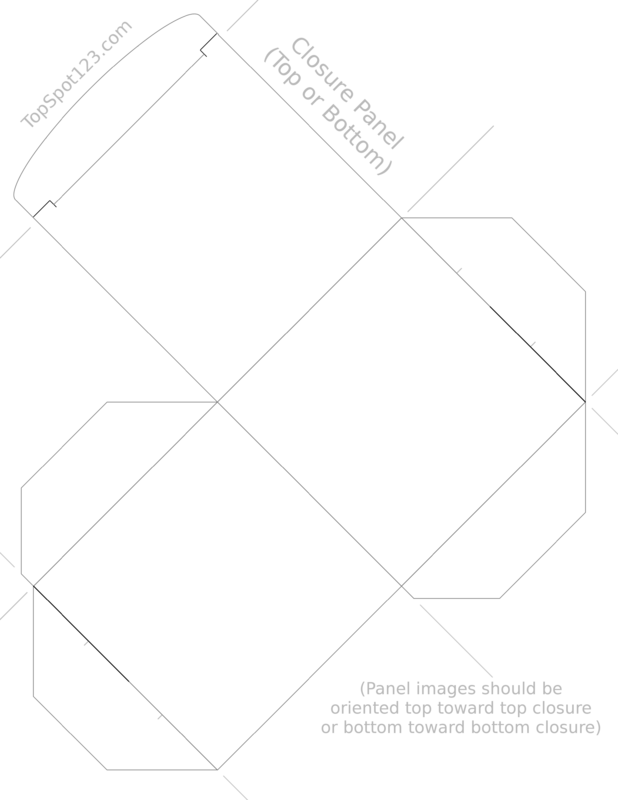 One way to do this is to turn one of your templates 180 degrees to better visualize where each panel will fall. I made the following reference image to try to give a better understanding. As mentioned in the video, the template is too large to fit standard paper without being reduced first. Your reduction percentage will make a printed box that will be roughly that same size in millimeters. A stack of five Gameboy cartridges with cases were approx 72 mm at their longest side, so I reduced the print output to 72%. 55% for the Playstation memory cards. I’ve printed boxes on cardstock and I also used standard paper and laminated it. I printed on both full sheet label paper and standard paper and mounted each on chipboard. Please see my tutorial videos and determine the best choice for your project. Don’t forget to score your fold lines. Option 1 (Simple): The tabs have a thicker line that runs up to the center. Cut these lines on all tabs to create slits that can be slid together, being sure to enclose the tabs within the box interior. Option 2 (Standard): Using the small guide lines, make one template with slots and make the second template with temporarily folded tabs. Push the tab through the slot, keeping both side tabs on the box interior. Once completely inserted, unfold the tab sides. This creates a stronger connection than the slit method and reduces the likelihood of the cube sides skewing. Using either option, it is recommended that you strengthen the side tab’s connections by gluing or taping them to the inside of the box. I’ve had good success with hot glue. The template allows for a certain degree of ‘locking’ of the top and bottom flaps. This is dependent on several factors: the print medium, the size, the accuracy of the build, the weight of the enclosed items, etc. If your box design has a designated bottom flap, you may wish to secure it closed as well with tape or glue. I had fun creating this project and all of the following templates! I plan on adding more templates over time. Be sure to check back. If you have a box template request, let me know and I’ll see if I can accommodate you. If you’ve made a cool box template, send me a copy! If I like it, I might feature it in this gallery to share with others. You might prefer to have a template with a proper locking bottom. The two templates are not interchangeable. They are unique and you need one of each to fashion this style of box. They are oriented in the same direction. NW is up and SE is down. 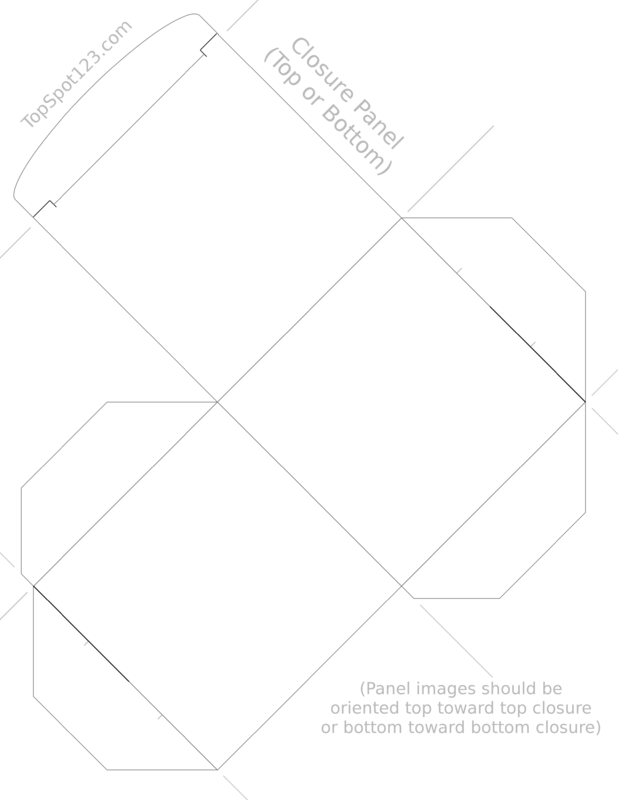 Be aware that the two template images have different page dimensions from the originals, and from each other, but the panel sizes are still 100 mm. Due to the increased template dimension, the template(s) must be reduced even more than the original to be printed on a standard paper. The locking bottom requires four times the effort to apply an image to.